Your oven is one of the hardest working appliances in your kitchen. As it sees a lot of use almost every day, it deserves a proper and regular cleaning. A clean oven is a healthy oven! Also, an oven that is not cleaned on a regular basis is more expensive to run, as it takes longer to heat up and consumes more power to keep its cooking temperature. However, attempting to perform a thorough clean-up on your own requires a lot of scrubbing and free time. Don’t waste your free hours on cleaning and polishing all hard-to-reach places and surfaces. Work with professional oven cleaners in Stockport as the more economical and practical option. 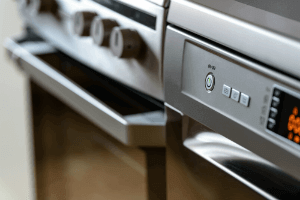 All applied cleaning techniques are perfectly safe for any type of oven – conventional, gas fueled, fan forced and even self-cleaning models. All used cleaning solutions are biodegradable and eco-friendly, so you can use your oven just after the cleaning process is over. After using their one-off house cleaning two times already, I'm considering to hire them as my regular maids. A very acceptable price for a very high quality service.